The Oklahoma Sooners pulled the upset and beat the Alabama Crimson Tide in the Sugar Bowl. For full stats, check out NCAA.com. Pass Offense: Trevor Knight had the game of his career, going 32-of-44 for 348 yards and four touchdowns. For a freshman, Knight showed a lot of poise and helped push the Sooners to the win. Lacoltan Bester led the receivers with six catches for 105 yards. Rush Offense: Oklahoma only rushed for 81 yards on 30 carries in the game, but it didn't matter much. Knight was strong in the passing game and the Sooners took care of business in upsetting the Crimson Tide. Pass Defense: Oklahoma had seven sacks in the game and was in AJ McCarron's face all night. McCarron did throw for 387 yards and two touchdowns, but only threw for 86 yards in the second half. Rush Defense: Alabama rushed for 139 yards on 34 carries, with Derrick Henry leading the way with 100 yards. Once the game became a passing game, and Alabama abandoned the run, the Crimson Tide had no chance. Special Teams: Jed Barnett averaged 45.2 yards per punt and Michael Hunnicutt had a 47-yard field goal. The biggest thing was Oklahoma made no mistakes in this phase of the game. Coaching: Oklahoma was the clear underdog heading into this game. You wouldn't have guessed it with the way the Sooners were ready to play in this one. Pass Offense: Trevor Knight is 18-of-23 for 206 yards and three touchdowns. His only mistake was a first-quarter interception, but other than that, Knight has been great. Jalen Saunders leads the team with five catches for 75 yards and two touchdowns. Rush Offense: The Sooners haven't run the ball much, rushing for 64 yards on 14 carries. It seems Oklahoma is only sprinkling in a couple of runs to keep Alabama off-balance, opting to go with Knight's arm, although the final touchdown came on the ground. Pass Defense: Oklahoma intercepted AJ McCarron twice in the first half, but did allow AJ McCarron 301 passing yards. Alabama may be down, but its not out of the game. Oklahoma will have to play even better in the second half. Rush Defense: The Sooners have held Alabama to 61 yards on 18 carries with T.J. Yeldon leading the way with 47 yards. Alabama hasn't ben able to get it going on the ground and will need to do so if they hope to win. Special Teams: Michael Hunnicutt nailed a 47-yard field goal, but other than that, there hasn't been much concerning special teams for Oklahoma. Coaching: Bob Stoops made a big call by going for it on 4th-and-1. That call resulted in an Oklahoma touchdown one play later. VIDEO: Has Jalen Hurts shown enough to be named the starter? 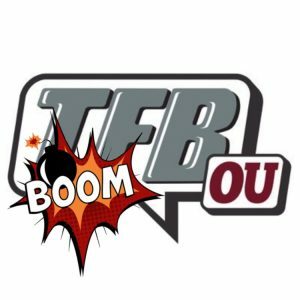 Finn Corwin Commits To Sooners | Boom!